Avayan's Farm is a small farm located in eastern Deshaan, just southeast of the Academy of Shad Astula. The farm is located just north of the town of Selfora, and is home to a special crafting site, where you may craft items in the Twilight's Embrace set. The crafting stations are famous across Deshaan, and visiting mages often request use of them from Master Avayan. 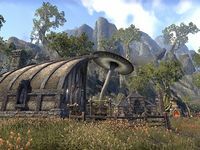 While the crafting site is called Avayan's Farm and the letter found in the house is addressed to Master Avayan, the house itself is named Avayn Farmhouse and belongs to Therana Avayn, who can be encountered inside.